You are eligible to contribute to your NHS pension scheme if you undertake locum work directly for an NHS employer. You are not eligible for the scheme if you work through a limited company or agency. If you are a portfolio GP with different roles you can still pension the work performed directly for an NHS employer. Complete the pension forms required and get them signed and stamped by the GP practice. Send the pensions office the completed pension forms with a cheque or BACS payment for your contribution within 10 weeks of doing the work. Employee contribution: This is your contribution to the pension scheme. It is calculated by estimating your annual income and using the tiered contribution table below to calculate what percentage you need to pay. The employer contribution: This is the practices' contribution to your pension scheme (also referred to as employer superannuation). In England and Wales this is 14.38% of 90% of your invoice amount. In Scotland and Northern Ireland, the contribution is 14.9% and 16.3% respectively; however these are paid by the PCO, not the practice. contribution should be added to your invoice to create a total amount due; each invoice must be accompanied by a Pension Form A, which you complete and your practice signs and stamps. to paying your pension contributions as these are based on the date paid not worked. How do I calculate my (employee) contribution? Your pension contribution is based on your anticipated annual GP earnings (inclusive of other pensioned NHS work, such as salaried/partnership work) and has a tiered contribution structure. The percentage contribution that you need to pay will depend on what level of income you earn and will also vary slightly depending on if you work in England and Wales, Scotland or Northern Ireland, as can be seen in the tables below. Occasionally, some practices will offer an all-inclusive rate that includes their pension contribution, for example, £600 for the day. However, you need to specify on the invoice the fee you are charging along with the pension contribution amount. You can calculate this by dividing the total rate (£600) by 1.12942 to give you a figure without pension contribution. In this case, you would invoice a fee of £531.24 and the employer's contribution of £68.76. MyLocumManager will do this calculation for you. What if I don't earn what I expected to? If, during the year, you notice you have incorrectly assessed your tiered contribution level, you will either need to pay the arrears to your Primary Care Organisation (PCO) or any overpayment will be refunded to you. 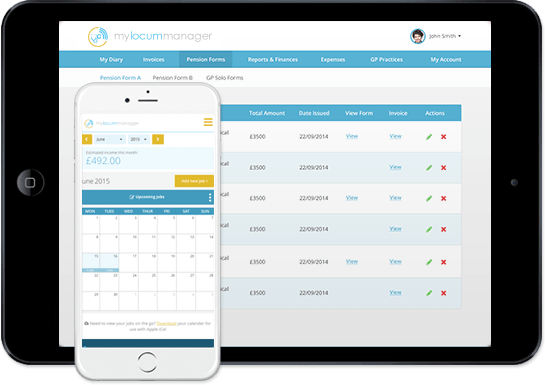 Because the MyLocumManager financial dashboard keeps track of your annual earnings, you will easily be able to see whether you are in the right tier or not. Are there any exceptions to the NHS Pension Scheme?